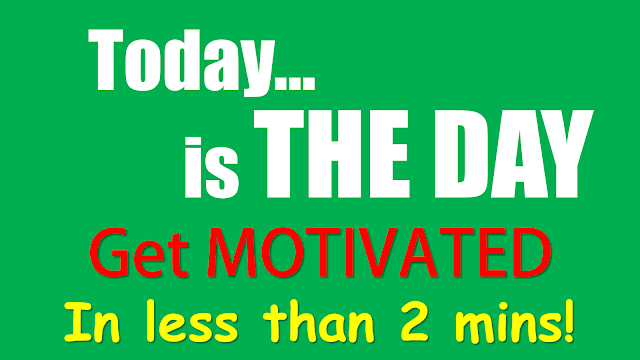 Today Is THE DAY - Motivational Video - Motivate Amaze Be GREAT: The Motivation and Inspiration for Self-Improvement you need! Once again we bring you a video from our YouTube channel, as you notice it's called "Today is THE DAY - Motivational Video. It's also a motivational speech by Philip Borges but with a different flavor and mood. But don't get it wrong, this can really motivate you if you take the time to listen and relate to the words. We accepted a challenge from a friend who said we couldn't motivate people in less than 2 minutes. The result is this video and you can judge by yourself if this is motivational or not. Jokes aside, this video can really empower you to live today and not thinking about other days, like yesterday or...tomorrow. Why are you stacking the best plates, the best wine, the best clothes, and the best perfume? Celebrate today, live like every day is that special occasion you've been keeping stuff for. Whatever the circumstances you've gone by, it’s never too late to find happiness. It’s never too late, Years of depression don’t translate in a future of misery, only if you let it...you can be happy in this instance. It’s a matter of choice and taking action forward. Find your loves in life. Chase them! Don’t take no for an answer. Use the “no” as a motivation to become better and better at what you do. Others don’t understand your dreams and goals, you don’t understand theirs either. So… what’s the point in comparing your life to others? - false friendships that remain in your life and you can’t rely on them in bad times. Life is a marathon, but like all marathon it has a start and finish. Your time is limited don’t forget that. You have to make the best you possibly can with your time here.